Brook trout are the only native stream dwelling trout species in New Hampshire, having a historic range that extended from Georgia to eastern Canada. 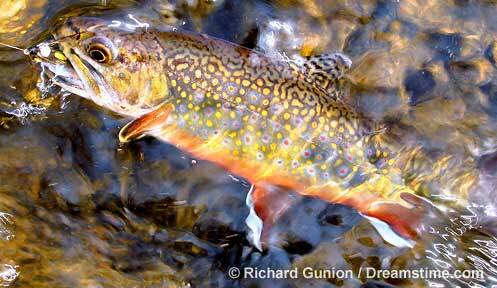 It is believed that wild brook trout were once present throughout all watersheds in New Hampshire. Increased stream temperatures, changes to water chemistry, habitat fragmentation, predation and competition, loss of spawning locations, and loss of stream habitat complexity have led to reduced and isolated populations of wild brook trout in New Hampshire and throughout the species’ native range in the eastern United States. The species is thought to be extirpated in almost half of the watersheds in their native range in the United States. In particular, historic self-sustaining, wild populations that once occupied larger river systems and lakes and ponds have been significantly reduced. Recognizing the reduction in the distribution of wild brook trout, the Eastern Brook Trout Joint Venture (easternbrooktrout.org) was established. This program under the National Fish Habitat Partnership Program consists of a public and private partnership of state fish and wildlife agencies, federal natural resource agencies, academic institutions, and local conservation organizations. The overall goal is to protect existing wild brook trout habitat, enhance and restore impacted habitat, and raise public awareness about their current status. These efforts will also benefit other native stream dwelling species, because brook trout serve as an indicator for healthy aquatic ecosystems. Fortunately, it is believed that New Hampshire has more intact populations of brook trout when compared to the southern portions of the species’ eastern U.S. range. However, information to quantitatively describe the status of brook trout populations in most of New Hampshire is limited. Brook trout are susceptible to changes in water chemistry and alterations to their physical habitat. Unfortunately, these changes to water chemistry and aquatic habitats may be difficult to recognize. Unlike a toxic chemical spill that may immediately kill aquatic organisms, the more common attributes that displace brook trout populations occur very slowly with no clear sign of obvious impact. Changes to natural stream substrate can significantly reduce the ability of a wild brook trout population to survive and/or reproduce. Excessive sedimentation from a variety of sources can embed and cover natural stream features in which brook trout have evolved to depend on. When this occurs, spawning locations, stream macroinvertebrates, cover, and holding areas can be lost or impacted negatively. The habitat needs of wild brook trout coincide with our own desires to protect the quality of water supplies and recreational areas. The brook trout is also an important game fish and symbolic figure in the heritage of New Hampshire. Records illustrating the importance of the species as a food source and sport fish in New Hampshire date back to the 17th century. Even today, the species is consistently one of the most highly pursued fish for freshwater anglers in the state. Additionally, the brook trout has been designated as the state’s fresh water fish. Since 2007, the New Hampshire Fish and Game Department has been conducting annual watershed scale surveys to assess the status of wild brook trout in New Hampshire. These surveys include electrofishing multiple locations to determine fish communities, macroinvertebrate sampling, and commenting on habitat conditions. The collected data is then promoted to local conservation groups and regional land protection NGOs. These summaries would not be possible without the countless hours of time donated by volunteers from the local towns and schools and groups like Trout Unlimited. The New Hampshire Fish and Game Department is extremely appreciative of the time spent and interest shown by these dedicated supporters. Because a localized collection of conscientious supporters continue to be active participants with these efforts, the information provided in these documents are expected to have a high level of significance. It is important to note that these reports should not be considered complete. As more data is collected, more opportunities to restore and protect wild brook trout habitat will become available. These summaries will remain as working documents, being updated and added to as needed.